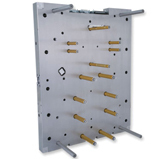 These INCOE systems combine plates and hot runner system components for reduced installation time in the mold. INCOE hot halves are fully assembled, plumbed, wired and pre-tested for functionality prior to leaving our manufacturing facilities. INCOE hot halves are ready for assembly to the cavity plate at the mold manufacturer, reducing delivery time to your customer. DF GOLD Systems can utilize either our threaded DFQ nozzles, or our compression fit DFX nozzles.